Apart from the budgetary allocation for Smart City Mission, India requires a clear vision and well-conceived roadmap for the safety of the cities, with a focus on improving surveillance system and other tracking parameters, the government has suggested. 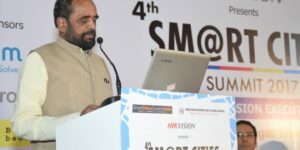 Considering the safety as an equally important element for any Smart City project, Minister of State for Home Affairs Hansraj Ahir during the 4thSmart Cities Summit, held in the national capital, said that the role of data and IT, especially video surveillance in enhancing security, has become vital. For SMART policing, the Home Ministry has provided INR 226 crore. under the Mega City Policing scheme for seven big cities Delhi, Mumbai, Kolkata, Chennai, Ahmedabad, Bengaluru and Hyderabad, he added. The minister said with rising public security awareness, increasing government security spending and initiatives such as Smart Cities and surging digitisation, the government sector has become the major player in the surveillance market, both in India and globally. The minister said Prime Minister Narendra Modi has also laid stress on SMART-policing towards making cities safe and secure. And for the Government, SMART stands for Strict and Sensitive, Modern and Mobile, Alert and Accountable, Reliable and Responsive, and Techno-savvy and Trained. Across India, police officials reel off cases where CCTVs have made all the difference in identifying offenders and speeding up investigations. Public surveillance cameras can be a cost effective way to deter, monitor and reduce crimes, he said. The ambitious and inspiring Smart Cities Mission launched by the government in 2015, with the ‘Smart City Challenge’ of building 100 smart cities over the next five years, is certainly going to boost the formation of safe and secure cities going forward, he added. Since video surveillance systems, the minister said, act as crime deterrent, criminals are less likely “to commit crimes in the area in the presence of advanced, well-covered video monitoring system”. He said seven in an industry accustomed to waves of change, “video surveillance is set to go through a metamorphic change”, and an unprecedented period of disruption and innovation. Moreover, “escalating video surveillance adaptation rate and increasing demand for high-tech technologies in the private sector has also become an important driver of the outstanding growth of the surveillance market”, he said. Each sector, especially public and private segments, has very varied needs and requirements and newer technologies such as full body scanners, cyber security and UAVs are going to play an increasing role in making cities safer, the minister added. Also present on the occasion was Minister of State for Electronics and Information Technology P.P. Chaudhary. He stressed on Digital India initiatives and schemes by the government like Aadhaar, digital lockers and computerisation of land records, gaining momentum in the country and playing a major role in the smart cities mission. The three-day summit has been organised by ASAPP Info Global Group and the India-China Economic and Cultural Council in partnership with the Smart Cities Council India.